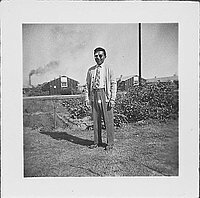 Man with bandaged proper right eye and sunglasses stands in grassy area with two barracks in background at Rohwer concentration camp, Rohwer, Arkansas, November 2, 1944. Dressed in sweater over shirt and patterned necktie, the man stands with arms at side and smiles at the viewer. Shrubs at CR midground; barracks in CL and CR background. 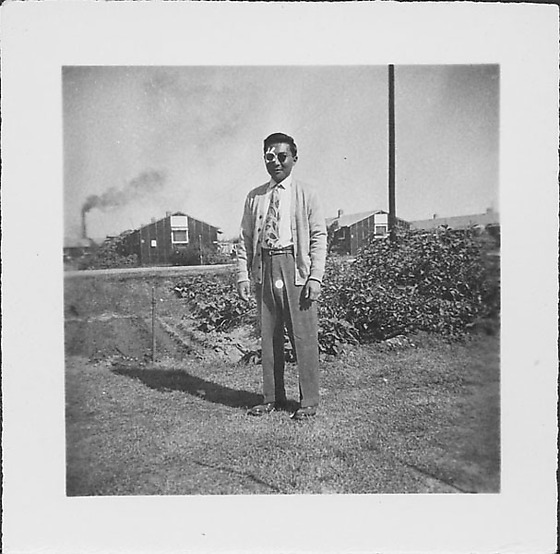 Smoke issueing from smoke stack in distance, R. A pole rises on the R. There is a small white circle over man's groin. Stamped on back: NOV 2 - 1944.